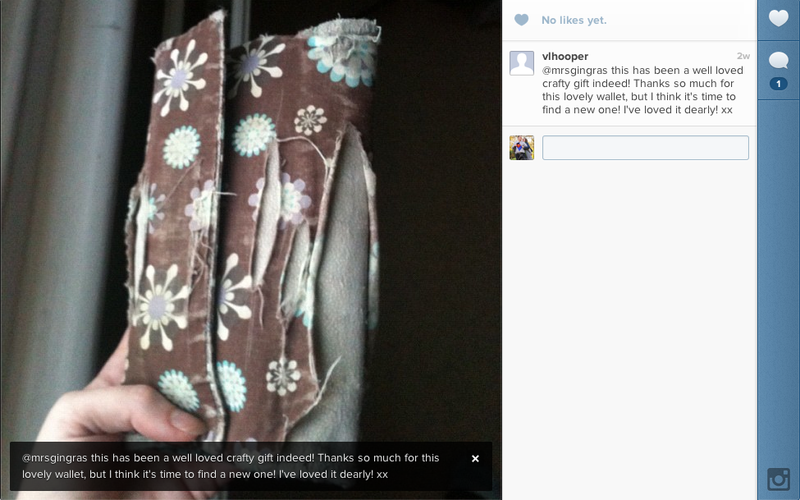 I made this wallet years ago... back when I first started sewing seriously. I was so flattered that Leanne had been using it all this time and loved it enough to wear it out. I instantly wanted to make her a new wallet. I don't make wallets in that style anymore, I have learned to love clutch wallets instead. I had been wanting to try adding a more functional zipper pocket and this gave me a good opportunity to try it out. I ended up making two. I wanted one, so I made twins. The zipper colours are the only real difference. Leanne is a Canadian, living abroad, so I snuck in some flags. A little reminder of home. The good news is that she likes it and I do, too. Does this clutch look familiar? It should I've made some before. Tutorial can be found here. Coralee, I love that you wrote a whole blog about my wallets! I really do love it so much and have been gushing about it to people at work and our parents! I love the little bit of Canada inside, absolutely love it, it warms my heart. And I'm so glad to hear that we are wallet twins! What a lovely way to think of you even more often when I pull out my fabulous clutch! It's brilliant and I am so grateful to you for making it. Brilliant job! I like the way you work for the creation of these clutches , the pair of blue one is very lovely and nice, the design is unique and zipped pockets inside are perfect for keeping small articles inside.